A trip to Baja for my birthday weekend was possible, so we packed up and headed south! 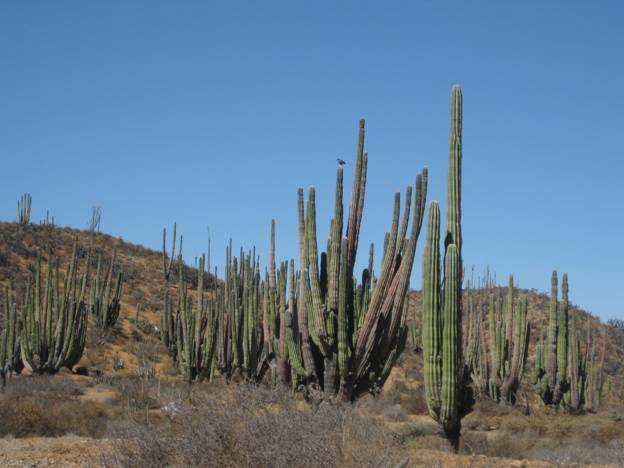 We slept well at the Baja Cactus Motel in El Rosario and were in no rush, so we casually got motivated and went 2 miles down the highway to Baja's Best (Bed and Breakfast) Restaurant... across the highway from the Turista Motel, on the far east edge of El Rosario. Elizabeth had hot cakes and eggs and I had their chorizo and eggs breakfast burritos... delicious! 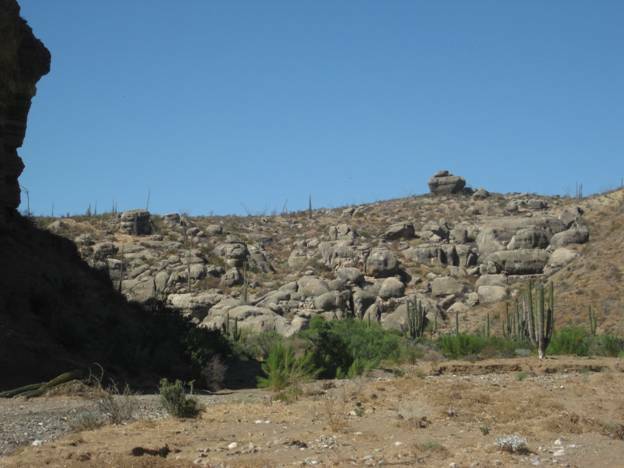 With so many interesting sites around El Rosario, we had not decided exactly which ones to visit until then. 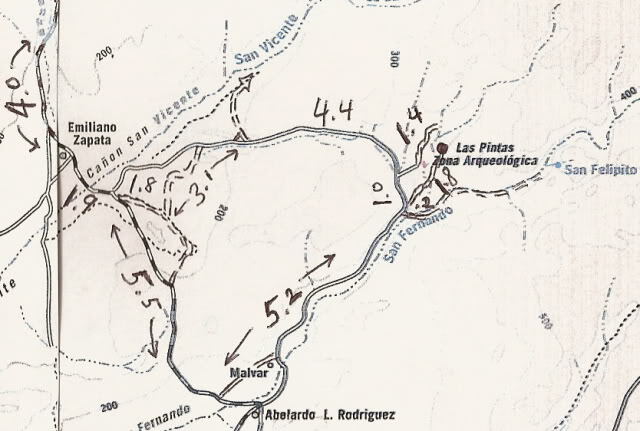 We decided on Las Pintas, but this time to try the northern road in and see more of the top of the boulder field. 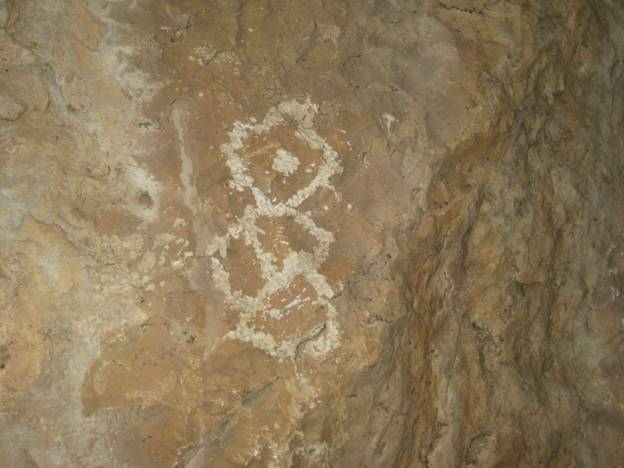 We have been to Las Pintas several times before, and it never ceases to amaze us. See Pintas for our day there in 2005 and when my son and I spent some time there in 2006 (on pages 5-7). The access to Las Pintas is off the road to Punta San Carlos, a tiny fishing village and nearby wind-surfing resort called Solo Sports, about 36 miles from Highway 1 Solosports The turnoff is between Km. 80 & 81 (just over 14 miles from El Rosario's Pemex station). There are two turn offs, the first one was signed for 'Puerto San Carlos' and the second one is just ahead at the second curve in the highway. Set your trip odometer to zero when you leave the pavement. 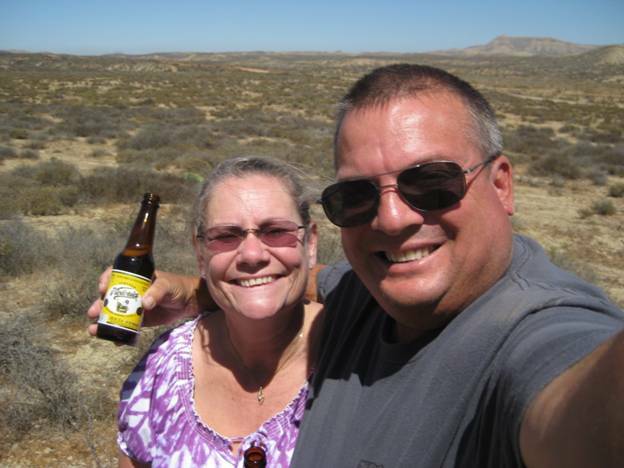 Six miles from Highway One we pull over for a beer break where the old road from El Rosario meets the new, graded road to San Carlos... Life is good! We noted the mileage at Rancho Emiliano Zapata as 10.0 from Hwy. 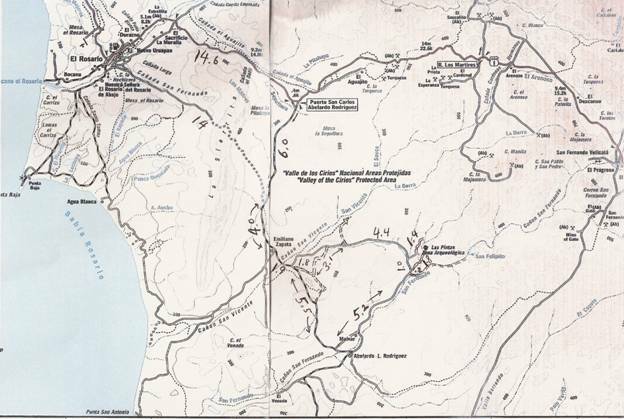 1, and knew the northern road to Las Pintas was not far past the ranch, and so took the first road we saw, 1.9 miles ahead. 1.8 miles on this side road is another road to the left (which was correct), but seemed to me to be going too far north so I elected to continue ahead. The road ahead returned to the San Carlos road. No matter, we will just continue south to the normal Las Pintas access road, and return via the less used northern road! 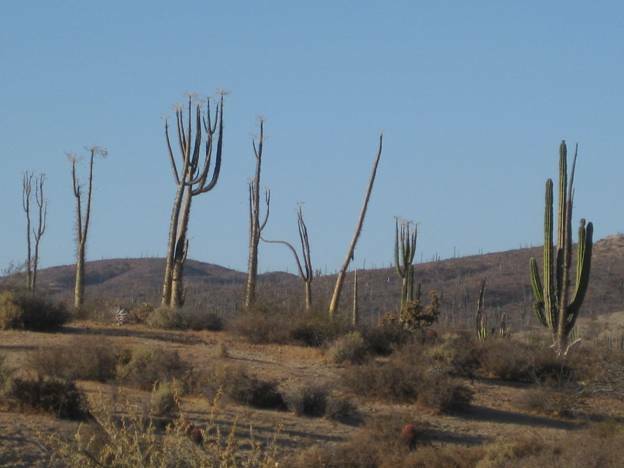 Just before the normal Las Pintas road, the San Carlos road enters a cardonal (a cardon cactus forest, the cardon is the world's largest cactus). 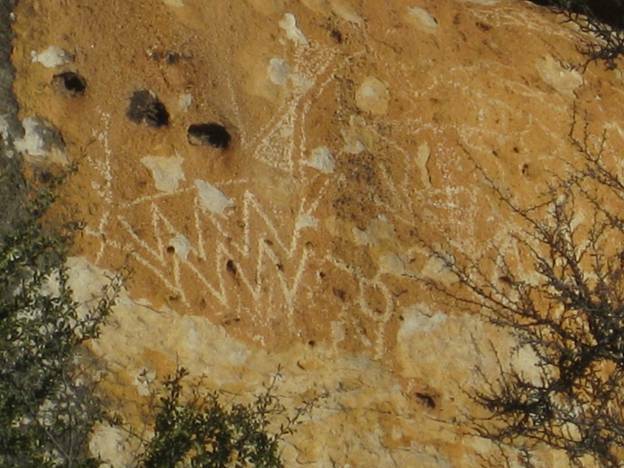 The Las Pintas road is 17.4 miles from Highway 1, and if you miss the first one, another is just ahead. 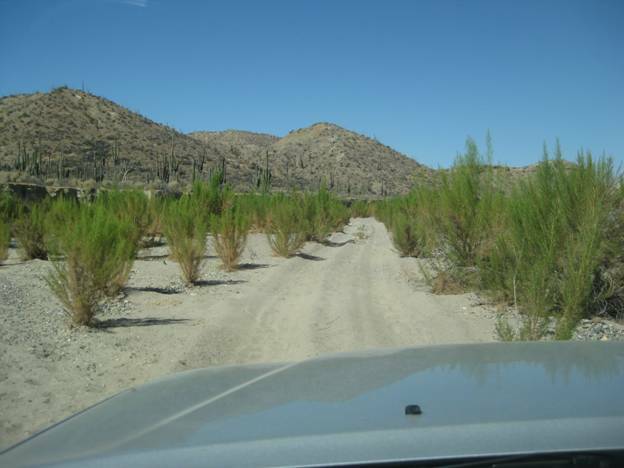 Go too far and a ranch is passed, then you will cross the big Arroyo San Fernando (a usually dry riverbed) indicating a U-Turn is required. Highway 1, southward from El Rosario 14.6 miles (between Km. 80-81), turn right at the left curve. GPS: 30°01.59', -115°32.09'. Go 17.4 miles on the good graded dirt road to a single track road going left. If passed, just ahead is a ranch house on the right and there is a second left road that joins the first. Set odometer to '0.0'. GPS: 29°49.65', -115°28.46'. Mile 5.2, (GPS: 29°52.56', -115°25.25') turn LEFT off of Arroyo San Fernando road, and follow a small side arroyo. Brush may scratch your vehicle in here. 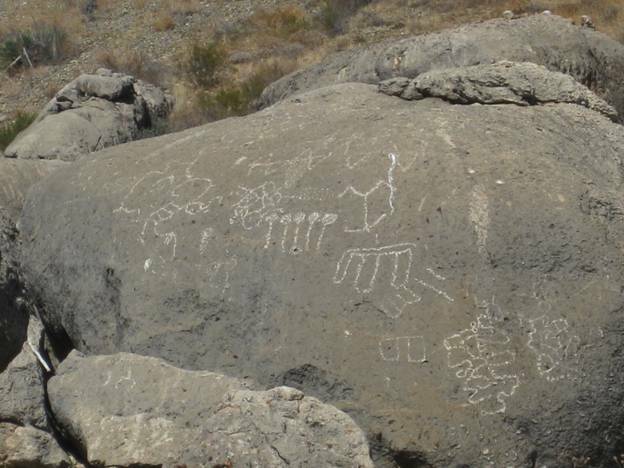 Mile 5.4, (GPS: 29°52.70', -115°25.31') turn RIGHT, out of small arroyo and cross low divide to small valley. Mile 7.2 LAS PINTAS parking area. GPS: 29°53.91', -115°24.52', elev. 755'. You are 24.6 miles from Highway 1 and 39.2 miles from El Rosario's Baja Cactus Motel and Pemex gas station, per my odometer. 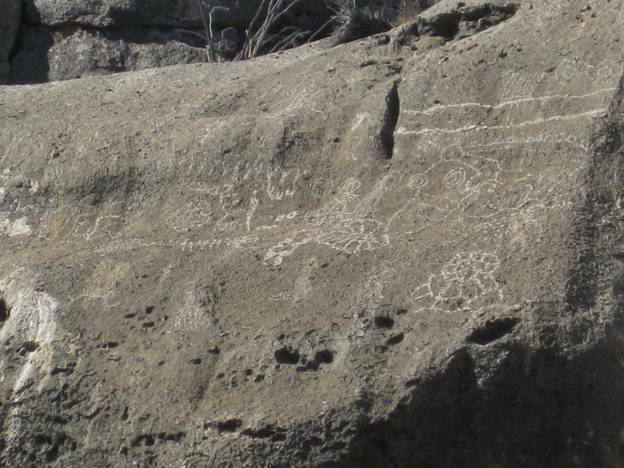 Okay, we have arrived at Las Pintas and we make a lunch, have some cold beer, and explore around the lower end of the rock art and fossil site. 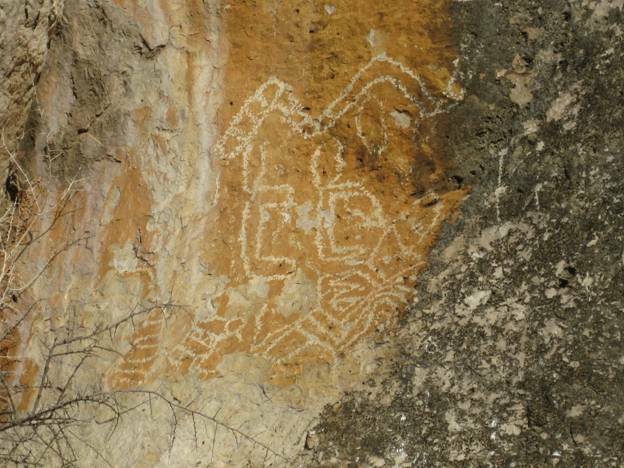 Plenty to see and photograph at the lower Las Pintas site and then we travel around to the top end of Las Pintas and see fantastic rock art that we have not seen before! 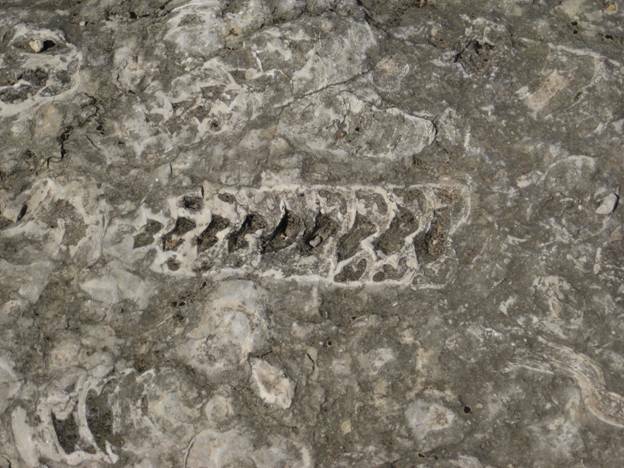 Fossils such as this lobster-like creature and various oyster clams are in the boulder at Las Pintas. 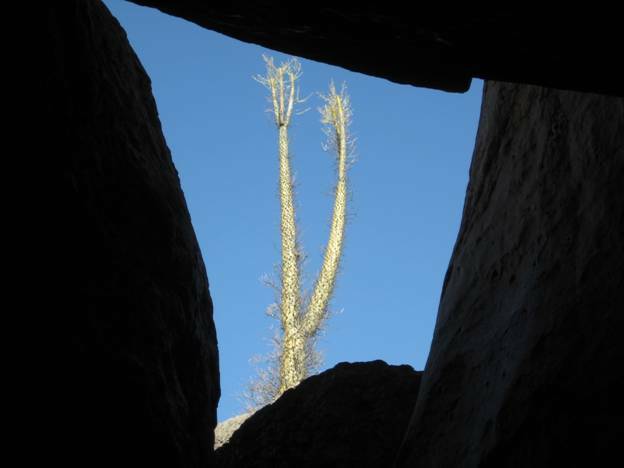 Boojum (Cirio) Tree seen from the big under-boulder room. 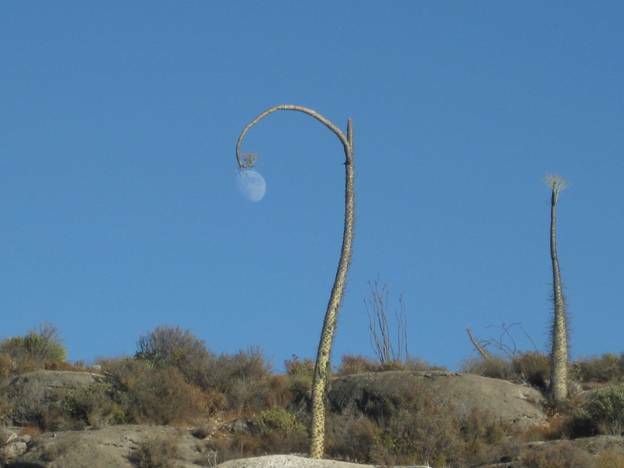 The boojum trees wave goodbye as we return to El Rosario from a great day at Las Pintas, one of Baja California’s great treasures.